This is something that gets my kids excited. They absolutely love these crunchy potato balls. This recipe came about as I needed to use up leftover mashed potato (I hate waste). I found the recipe in a magazine and had cut it out for such a time when I had leftover mash. If you don't want to add the garlic salt or chicken stock powder, as your kids may not like it, make it without it. They are still delicious. You can make mashed potato for this recipe, it doesn't need to be leftovers only, just allow the mashed potato to cool, before making the balls. 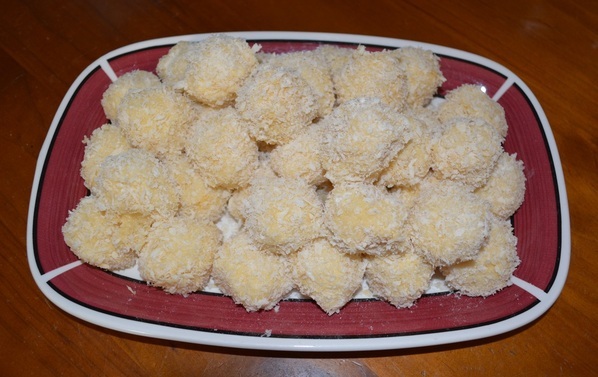 With leftovers, I like to make the balls once dinner is finished, then place them (uncrumbed) in the refrigerator overnight. But if you are tired or are having a party, you can make the balls out of fridge cold mash. I sometimes use a measuring spoon to make the balls, sometimes I don't, but if you want them to look uniform in size, use a measuring spoon. I also shallow fry mine, the original recipe says to deep fry them, to me that is just a waste of oil and unnecessary, but you do what you prefer. These are so good with the light and fluffy insides, and the crispy fried breadcrumbs on the outside. A great side to many dishes. Next time you have leftover mashed potato, give this a go. Add the mash to a large bowl. Add egg, parmesan, salt and pepper, to taste, mix well. 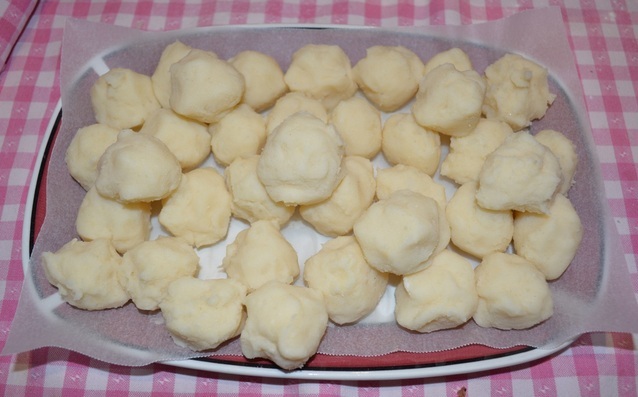 Using a tablespoon measure, roll the mixture into balls (having your hands dusted in a little flour makes this process easier). Refrigerate overnight or for at least an hour. Place flour in one bowl. Place egg and milk in another bowl, beat well to combine. Place the breadcrumbs, garlic salt and stock powder in a third bowl, mix to combine. 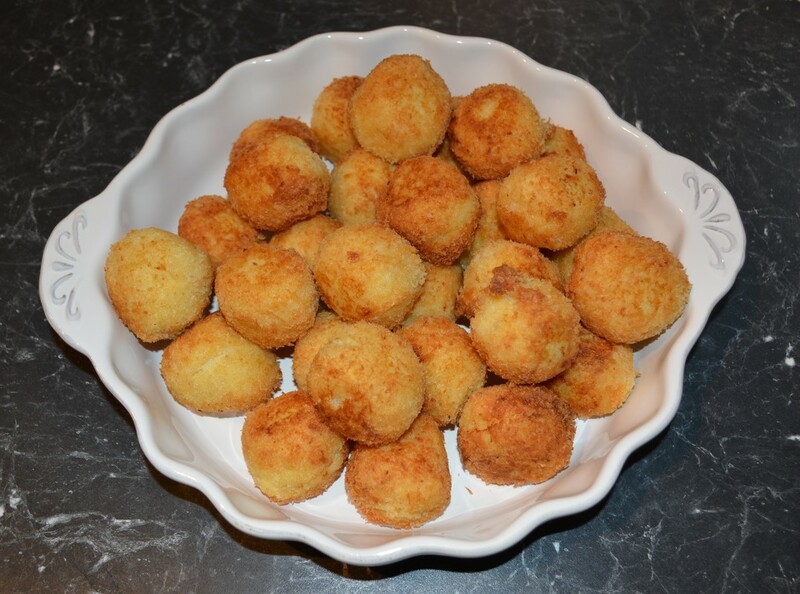 Gently roll the potato balls in flour, then dip in beaten egg and milk, then toss in breadcrumb mixture. Add oil to a frying pan (you need it to be about 1/2cm oil) heat over a medium heat. 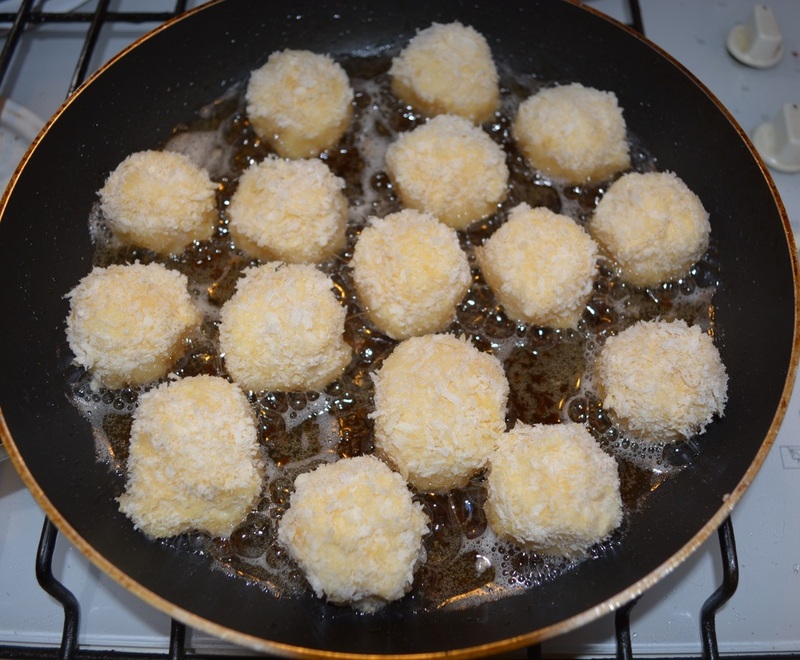 Place the balls in batches in the hot oil and fry, turning every minute or two (once golden on the bottom) until the entire ball is golden brown and crispy. The oil should not be burning the balls, if the oil is too hot, decrease the heat, if too slow, increase the heat. Drain on absorbent paper. Serve hot with sour cream and garnished with sliced lemon and tomato wedges.